Ricky Burns has his sights set on bigger fights after a confident if unspectacular first defence of his WBO lightweight belt. The Scot scored a unanimous points win over the Namibia-based Paulus Moses in front of a 6,000 capacity crowd at Braehead Arena on the outskirts of Glasgow. Burns has now won six fights at world level and will discuss options with the promoter Frank Warren and his manager, Alex Morrison, early next week. A fight with Kevin Mitchell, the Londoner who holds the WBO intercontinental belt after a thrilling victory against John Murray, would capture the imagination of boxing fans on both sides of the border, but Burns was reluctant to name names after his latest comfortable triumph. 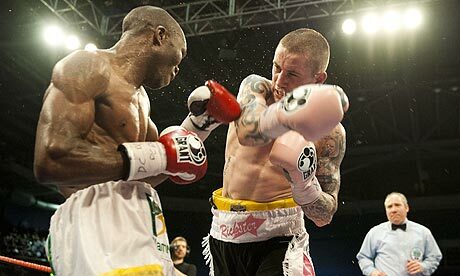 Burns said: "I'm happy to get the win, it was a good fight and a good 12 rounds in the bank. I'll get a wee break now and sit down and talk about what happens next. "There have been a few names out there mentioned. I have always said I will fight whoever they put in front of me. Rather than me shout out names and who I want to fight, I'll do my talking in the ring. Whoever they want to get me to fight, it's no problem at all. I got the win and we can start looking at bigger fights now." Although Burns was never in trouble, the scorecard of 119-110, 120-110, 117-111 probably did not reflect the difficulty Burns had against the 33-year-old former WBA lightweight champion, who has 19 knockouts to his name. Burns, who struggled with a minor shoulder injury in the final few rounds, acknowledged his opponent's threat had forced him into caution at times. "Some of the rounds it was tough," Burns said. "He could punch, he caught me with a few good right hands. I've always said I can take a good shot. I shrugged it off and got on with the fight." The Coatbridge boxer, who dominated the first five rounds, added: "A few times I banged them body shots in, a couple of times I thought I hurt him. But he was taking them well and I didn't want to dive in because I didn't know if he was trying to draw me in. He was looking for the counters all the time and the right hand over the top, which he caught me with a couple of times. "I thought I was doing all right but maybe I shouldn't have got caught those couple of times. But I'm still learning and I've always said there are still more improvements to come. I can look onwards and upwards now." Whatever the profile of the next opponent for Burns, who gets married next month, he has proved he can draw an increasingly large crowd. Braehead had been only half full for his previous two fights there despite his stunning victory over Román Martínez at the smaller Kelvin Hall. After fights in Liverpool and Wembley, Burns sold out the arena and the atmosphere at times evoked that memorable night against the previously unbeaten Martínez, when Burns upset the odds to win the WBO super featherweight title. The 28-year-old said: "I just want to thank everyone that has come down. I couldn't believe it when I walked out. The fans were fantastic and I hope they all had a good time. When I walked out the changing room, you could hear them all singing. Everyone says the Glasgow crowd are excellent and they proved that again."